Best coverage of any paint on dark fabrics and leather! USE FOR: Metallic Effects, Stamping, Stenciling, Handpainting, Airbrushing (thinned), Silkscreen. USE ON: Natural fabrics and most synthetics and blends, wood, paper and leather, both light and dark. Lumiere & Neopaque is just about the best fabric paint available anywhere. The secret is that it contains more pigment that is higher quality than other paints. Lumiere is also the most shiny metallic fabric paint we have ever seen, and both Neopaque and Lumiere are totally opaque for the best coverage of dark fabrics and leathers. Great for metallic accents on dyed or painted silk too! These paints work on many other surfaces besides fabric, like leather, wood and paper. Shoe painters say these give the absolute best coverage on any color leather. Fantastic paints! NOTE: Gallon (128oz.) sizes are Drop Ship Items! Please call for details. We estimate an 8 oz. jar will cover 12 sq. feet when painting and 24 sq feet when stamping. The Lumiere is truly metallic, not just metallic colored. Easy clean up with soap and water. Excellent washfastness and drycleanability after heat-setting with an iron or commercial silk screening dryer. Great for stamping and stenciling too. Produces clear prints with fine detail. Leather can also be painted and need not be heatset. 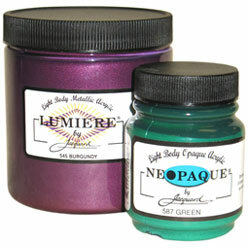 Lumiere & Neopaque Extender is used to lighten colors without thinning the paints. Lumiere Starter Set Contains 2.25 oz. each of Lumiere Gold, Bronze, Silver, Russet, Copper, and Pearl White. Neopaque Starter Set Contains 2.25 oz. each of Neopaque Yellow, Red, Blue, Black, White, and Magenta. Lumiere Palette Demystified from Jacquard Products on Vimeo. As a resist: LUMIERE paints can be used as an alternative to colored and metallic resists. Safe to use and permanent after heat setting. Apply the paints with a fine line metal tipped applicator, brush or stamp. Set according to directions and then paint with dyes. Line work and surface decoration: Once your fabric is dyed or painted, set, rinsed and ironed, use the paints for surface embellishments and highlights. This can be line work, brush strokes or stamping. Set the paints. Stencilling: LUMIERE paints will produce clear print resolutions and hold a fine detail. Use stencil paper, waterproof per-cut stencils and masking tape. Excellent with traditional stencil brushes and foam rollers. When using the foam roller, the number of passes will determine the effect. You can obtain from a brushed look to crisp solid color. Stamping: Great for stamping! Make your own with our flexible printing plate, or purchase ready made stamps. Apply the paint to the stamp lightly with a foam brush. Apply even pressure and stamp. Marbling: when marbling use a methyl cellulose base. Some customers have obtained spectacular results when using the LUMIERE paints in combination on one project. However, because of all the pigment, these paints are notoriously hard to float on the size (tend to sink), so we actually do not recommend this product as a paint of choice for marbling. Sponge painting: Use sponges with different textures to imitate the look of rocks, wood or marble. A wide variety of sponge textures are available at hardware stores and drugstores. Apply the paint directly into the sponge and print. Use for repeat patterns. Several colors can be used at one time to simulate patterns. Monopainting: You may wish to add some extender to the paints because they dry very quickly. Using the back of a spoon, lightly coat a smooth flat surface (Plexiglass, glass) with the paints. Outline shapes with tool and /or drop some isopropyl alcohol. to disperse the paints. Place fabric (silk canvas, etc) over that and use a brayer or roller to imprint. Leaf and found object painting: A leaf is the perfect example. Coat a leaf with paint (blend colors directly on the leaf). Place the painted leaf upside down on the fabric. Cover with paper and apply even pressure either with your hand, or a roller or a brayer. Remove the leaf, dry and set. The effect obtained by feathers and other found objects is quite attractive. Painting leather: LUMIERE paints are very effective on leather and do not require heat setting. Use only leather which has not been waterproofed and has no repellent finish. Air cure for one week before dry cleaning. Create custom leather accessories such as belts shoes, gloves, wallets handbags and jewelry. Revitalize old leather shoes, belts, boots, etc. When properly heat set, painted fabrics can be laundered and dry cleaned. They have excellent wash-fastness when laundered on the gentle cycle and dried on low heat without fabric softeners. Items which will not be laundered need not be heat set. When applying one product over another, always set the first before applying the next. allow the paint to dry to the touch and air cure for 24 hours. Set the paints in one of the following methods. For smaller surfaces, use a dry iron and protect your iron and ironing board with a press cloth. Iron both sides for a least 30 seconds on each side, with the iron set on cotton/linen setting. For large projects and yardage, approximately 3 to 5 yards, or for sensitive fabrics such as polyester, nylon and acetate, use a high temperature commercial dryer set at 180 degrees for a minimum of one hour. Painted leather does not require heat setting and can be safely cleaned through a leather cleaning process after the leather has cured for one week. What is the difference between Lumiere & Neopaque, Dye-Na-Flow, and Textile Colors? Can I mix Lumiere & Neopaque with Jacquard Textile Colors and Dye-Na-Flow? How do I use Lumiere & Neopaque for stamping? You can use them straight from the bottle. Try applying them to the stamp with a sponge brush or makeup sponge. Can I thin Lumiere & Neopaque for airbrushing? Yes. They can be diluted with water by up to 25% to pass through an airbrush. Are Lumiere & Neopaque dry-cleanable? Yes. Once properly heat set, Lumiere & Neopaque are dry cleanable. When do I use the Flowable Extender? Flowable Extender is the medium-bodied clear acrylic base for Lumiere & Neopaque. Mix it into any other Lumiere and Neopaque color to create transparency without changing the consistency of the paint. For a transparent metallic shimmer, try adding some Pearl-Ex Powdered Pigments to the extender for use on fabric. Ironing is a major home option. Preheat the iron at the maximum temperature safe for the fabric. Most paints say to iron each spot for 2-3 minutes. Using Aluminum foil can cut back on this time. Place aluminum foil on the ironing board with the shiny side up. Put the fabric over that with the painted face down. Place another sheet of foil on top, shiny side down. Each square foot must be pressed for 15-25 seconds keeping the iron moving so as to not scorch the fabric. (Inexpensive plastic irons sometimes don't get hot enough). A commercial dryer that reaches 250 degrees minimum can be used for 30-45 minutes depending on the fabric and fabric paint used. The dryer must be preheated and please note that home dryers usually don't get hot enough. Another method is using a commercial conveyor type oven: 350* for 3 minutes, 2 passes if necessary. A home oven can be safely used (except for accessories that have plastic inserts! ), 250* for 25 min. Coil the fabric in a loose roll and lay it on some paper, not allowing the fabric to touch the side or rack of the oven. All temperatures and amounts of times are dependant on the fabric, fabric paint, amount of coverage and equipment used. TEST! To eliminate heatsetting, try Versatex's No Heat Fixative! Works with most brands of fabric paints. How can I do monoprinting using Lumiere & Neopaque Paints? To slow the drying process you should add extender to the paints. Using the back of a spoon, lightly coat a smooth flat surface (plexiglass, glass) with the Lumiere. Outline the shapes with a tool and drop some isopropyl alcohol to disperse the paints. Place fabric (silk, canvas, etc.) over that and use a brayer or a roller to imprint. Detailed instructions on how to personalize a quality Silk Tie for that special someone in your life. Great for all ages! Step by step tutorial on creating hand-made ornaments with photographs. Six 2.25oz. bottles (Gold, Bronze, Silver, Russet, Copper, and Pearl White). Includes instructions. Six 2.25oz. jars (Yellow, Red, Blue, Black, White, Magenta). Includes instructions. Use the Extender to lighten colors without thinning the paints. Extender - 2 1/4 oz. This is absolutely my favorite metallic paint! It goes on so smoothly and leaves a soft texture not stiff at all. It works on all kinds of fibers. I've painted it on silk for an embellishment and it leaves the silk still lovely and soft but with a metallic sheen. I've used it on leathersuede shoes paper even my front door! Love these! Durable easy to use easy to clean up beautiful colors. After heat setting (24 hours to dry) they are wash and dryable. I don't even turn them inside out. I ordered some of the lumiere paints for use on leather which is a very difficult material to print on. These inks work wonderfully on the deerskin so far next i will try split lambskin (suede texture). To test the durability I stretched the hyde and wet the surface and even scrubbed it with the scrubbing side of a sponge and it has withheld all began to scrub off eventually but really a terrific paint and I highly recommend to anyone that is block printing or painting on leather. We love Lumiere as a gutta. Beautiful product the Lumiere goes on so smoothly and it is a nice opaque colour with one or two coats. It's good for synthetic fabric. Love the Lumiere paints!! 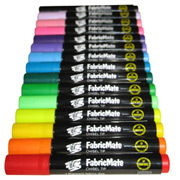 (pronounced loo-MEE-AIR btw) and they are the absolute BEST for painting on dark or colored backgrounds. Sooo shiny!! While the Jacquard paints are great I am fed up with the mess working from a jar creates. I also use Golden Highflow Acrylics. These paints come in a bottle with a no mess pull-up top which also serves as applicator. Goodbye Jacquard! I used Lumiere Pearlescent blue paint bridesmaid shoes--highly recommended for getting all maid's shoes the same shimmery color. Ive been using jacquard lumiere and neopaque paint for many many years in my business www.wingitdesigns.com It is the absolute best. Highly recommend . Look at my feature artist page for typical results. I have used this on leather purses and shoes to create unique designs and embellishment. It goes on like a dream has great coverage and flexibility and the color range is excellent. Highly recommend this product.